Bishamon’s LoProfile™ LX Lift Series are electro-hydraulic lift tables that offer heavy-duty lifting power and convenient low profile functionality. These tables can handle capacities up to 4,400-lbs. and feature a variety of platform sizes and lift heights. Lifting power is provided by a high-performance, external electro-hydraulic power unit with a steel braided hydraulic hose. Platform movement is controlled by a convenient hand-held push button control station. For additional functionality, LoProfile™ lifts can be used in conjunction with optional accessories such as a foot operated control and approach ramps. The LoProfile™ series of lift tables increase worker productivity and reduce strain by positioning materials at a comfortable and convenient operating height. They maximize efficiency in a number of different environments, including production facilities, assembly areas, and warehouses. 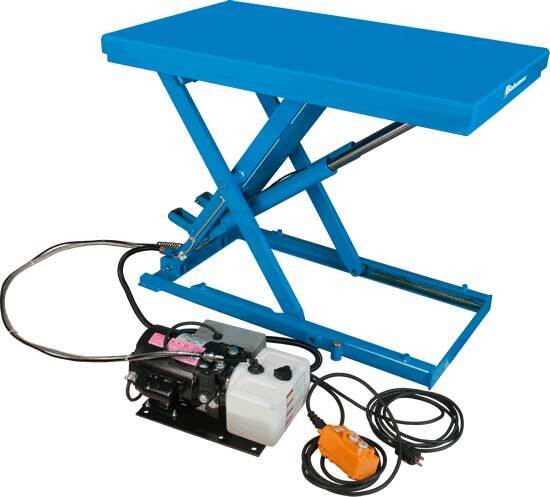 Designed for durability and practicality, LoProfile™ lift tables will last for years with minimal maintenance. LX-100W 35.5 34.5″ x 51″ 3.3″ 38.6″ 2200 lbs. 606 lbs. LX-200WM 35.1 45.5″ x 61.5″ 4.3″ 39.4″ 4400 lbs. 1110 lbs. LX-200N 35.1 33.5″ x 55.5″ 4.3″ 39.4″ 4400 lbs. 860 lbs. LX-200WL 35.1 45.5″ x 81″ 4.3″ 39.4″ 4400 lbs. 1238 lbs.